Enjoy BATMAN™ as an individually numbered limited edition push puppet! Push the hidden button on the bottom to see the DARK KNIGHT™ move! 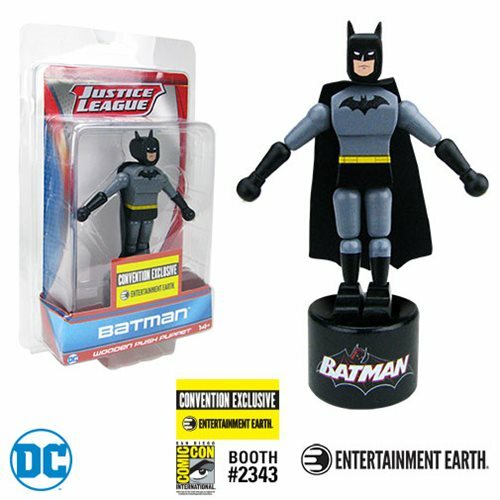 Entertainment Earth Convention Exclusive! Thanks to the clever designers at Entertainment Earth, you can enjoy BATMAN™ as this exclusive 5-inch scale floppy wooden puppet that collapses, moves, and stands up again when you push the hidden button on the bottom of the base! Created from solid wood, this BATMAN™ Classic Wood Push Puppet - Convention Exclusive features vivid hand-painted artwork, along with some decal elements. Cute and fun as can be, the redemptive DARK KNIGHT™ is designed in a vintage style reminiscent of traditional push puppets known as Wakouwa. Plus, as an Entertainment Earth Convention Exclusive, he's individually numbered with the limited production run number on a holographic sticker! Ages 14 and up. Classic BATMAN™ Wooden Push Puppet Makes Its Debut at San Diego Comic-Con!